Rawr!Is dinosaur for I love you. Ask any paleontologist, and they will tell you the same thing. When you mix babies and dinosaurs you get nothing but adorable love. Your baby is just like a little dinosaur. They love to sleep, messy eating, and to be near mom and dad. When they aren't napping they are learning quickly how to hunt like yoshi and steal hearts. Babies love to be cozy and have a roaring good time all at once. Being a dinosaur for Halloween is the best chance to do both! They can learn how to walk like a T-Rex and wag their little tails while dancing like a dino. The Infant Dinosaur Costume is 100 percent soft polyester. The green velvety jumpsuit has a Velcro closure at the back. The legs have snap closures making it easier to get in and out of the costume. Featuring paw shaped feet that have skid resistant prints making it easier for the little one to roam like a dinosaur. For added cuteness the chest and tummy have purple stripes to show off dino moves. Making sure the head is warm the hood has felt-like spikes and teeth, the plush face is soft and closes in the back with Velcro. 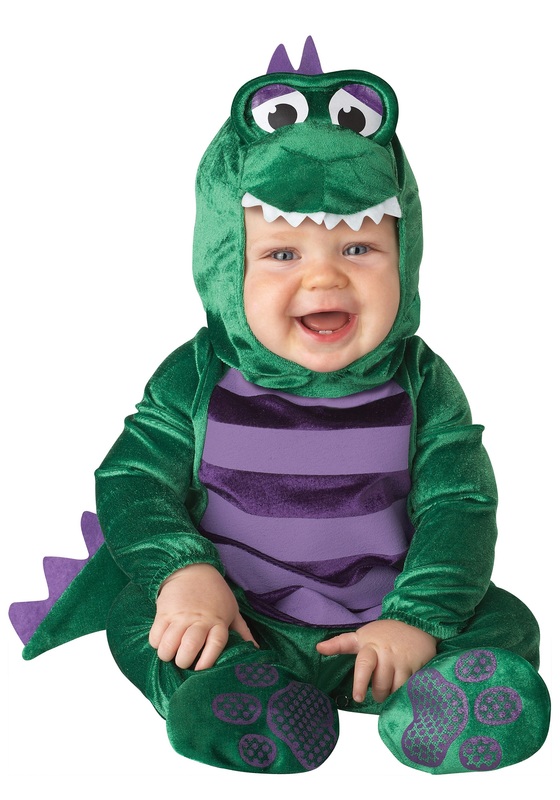 Let your little one rawr to the top of their lungs while having a great time.